In what I've already confeessed to having been one of my more clueless posts in the history of JimLyonsObservations, it's been six months to the day since my infamous "Do we need printer industry tweets?" and the conclusion, actual two conclusions, are the a) yes, we need them, and b) wake up, Lyons, we already have them! 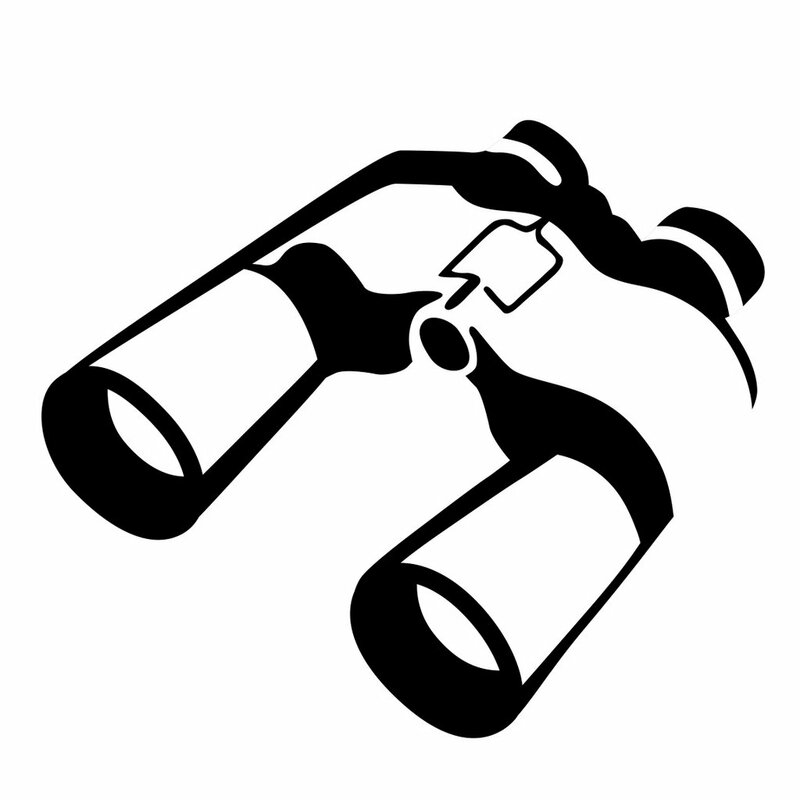 As I pointed out in my July Observations, "Twitter Printing", I was in that very typical early Twitter user confusion state six months ago. I'd had an account for some time, couldn't see what the fuss was about, and assumed most everyone else was with me. As it turned out, much printer-related Twitter activity was already under way, and the number has grown significantly. How so you might ask? Well, like in other web activities of the recent past, certain categories lead in tweeting as well. The printer OEMs are doing some tweeting (for example, @HPIPG, @xeroxevents, and @LexmarkNews), and some of the research houses and analysts come through with some too (e.g. @Infotrends), but the champs are split among the traditionally active bloggers, both growing and established (see @greg_walters, @artpost, @driessen, Greg_VDQ, and the irrepressible @databazaar) and those who cover commercial printing as well as some of those participants (@neenahpaper and @whattheythink come to mind). Just a quick look at these 10 or so Twitters accounts (all among my 1,000 or so "followed" accounts) shows a range of one or two orders of magnitude in their numbers of followers and tweets (or "updates"). It's clearly still a developing area, but I have visions of maintaining a regular "printer industry members on Twitter" listing, much like those of @KentHuffman and his Marketing-related Twitter lists. So printer-industry tweeters, please make your presence known, and thanks for all those great tweets! In perusing (yes, as in studying in detail) HP's earnings information including the Q3 FY2009 earnings call transcript now available online, I found one interesting tidbit worth a short blog post of its own, IMHO. Well, supplies if you start looking at the data we look at and I'll let [CFO] Cathie [Lesjak] comment on it as well, supplies has really been pretty consistent through this entire environment and you have to look at it again ex currency and you have to look at it ex inventory correction and when you look at the data we get back from consumers printing is one of the least things they want to stop and when we look at our enterprise business we actually have the benefit of having major contracts with very big companies where we actually manage all of their printing and they give us annual estimates for how much they will print in a year and most of our customers are exceeding those estimates even in this economy of how many pages they're printing so from a supplies perspective it's been pretty consistent and clearly what people have chosen to do is not buy that incremental unit they would ordinarily buy in a good economy. While that's an interesting tidbit from a print demand standpoint (and would seemingly contradict indications of print declines from elsewhere), I am also fascinated by the idea that the presence of Managed Print Services contracts add foresight into print volumes and supplies revenues. What are possible reasons for printing increases, from an HP perspective? Are the devices under management (predominately HP-branded machines we assume) now the favored printers and copiers, taking on print volumes that might have been diverted outside the managed group? So perhaps overall printing is down in the organization but printing on the HP-managed hardware is up? Hmmm...stay tuned on this one. As is my quarterly tradition, here's a tracking table of HP's printer-related numbers released as part of the after-the-close announcement yesterday, August 18 2009. With the HP (NYSE HPQ) third-quarter earnings announcement set to come after tomorrow's closing bell (see "Hewlett Packard Likely to see Strength in Services, PCs"), an intriguing view of the industry comes from colleague Tom Ashley at Pivotal Resources. In a new white paper, "Does Digital Printing Have a Future?" (free registration required), Ashley reports some very revealing results from the paper side of the printing equation, pointing to longer-term trend line declines in printing going back ten years. The report goes on to detail further industry metrics, including those for "uncoated freesheet paper", the subset of printing paper most relevant to digital printing, and similar numbers noting declines in Europe. Ashley's premise includes the need for the industry's own acceptance of printing's decline, that goes beyond seeking correlation of recent shortfalls (like HP's recent quarterly supplies declines) with decreases in business activity and economic factors. Rather, the shifts need to be understood more for "changes in business processes and worker habits" to include even recently touted duplex printing, and that have made for longer-term, fundamental declines, exacerbated but not caused by macroeconomic factors such as lower employment. His antidote? As expressed in the white paper and in follow-up conversations, Ashley sees the industry at a crossroads, needing to accept changes with a healthy perspective, and begin to more actively seek out related printing opportunities. Some of these are quite familiar, like short-run digital replacing traditional commmercial print jobs (which, he acknowledges, are already contributing to the paper usage decline), transpromotional printing, and some not now as visible on the horizon, but coming fast, for example decorative printing. A highly recommended read, once again at the Pivotal Resources web site, "Does Digital Printing Have a Future?" After last month’s Twitter printing column, I planned to write a next-level column on Twitter document management. But when my editor subtly suggested that I “give Twitter a rest,” I realized she and most of you are probably among that silent majority of our population that is getting fairly fed up with the vocal minority of Twitter fans (or freaks, may be more like it.) So I am following the suggestion and giving Twitter a month off. My title “Summer Rerun” was selected partly for its cliché value, as there are many fresh developments to be covered. Also, as I write this column, summer is in full swing, and because my subject matter includes companies and technologies from past columns, the television term “rerun” comes to mind. But lest you are tempted to stop reading now, be aware that each of my subjects has late-breaking material to be reviewed. Two startup firms I have covered in the past have been in the news recently, with varying degrees of pleasantness. In February 2007, my column described GreenPrint, the Portland, OR-based company with a product of the same name that helps users control and eliminate unwanted printed pages. None other than Walter Mossberg of the Wall Street Journal’s Personal Technology column had positively reviewed the firm’s initial product. Since then I have tracked GreenPrint, after visiting the company and testing the product, and I was interested to see a company profile and a review of the new version of the firm’s software, this one in The New York Times. P.T. Barnum said there is no such thing as bad publicity, but this review was not as favorable as Mossberg’s. (Goel’s product review is in a separate online-only review titled, “GreenPrint Saves Paper and Ink at the Price of Speed”.) Goel knocks the product’s performance, and my personal results have been mixed as well, as compared to the original version. One PC was significantly faster, but another (my production laptop) exhibited odd, halting performance. Troubleshooting with the firm continues, though the recent 2.0.3 version has improved the performance noticeably, especially after the first print job after a restart. I do not know if I should feel a little guilty, being a part of “all the press,” but seriously, Karp’s thoughtful blog post will go with the NYTimes GreenPrint piece as an example in my classes. I also have fresh news on a new theory espoused last year by Wired’s Chris Anderson, of Long Tail fame. When I covered his idea, based on “Free” pricing, in my March 2008 column, I asked, “Do printers fit with this new ‘Free’ thing?” My reply: “hmm, maybe.” Well, the book was released this summer and is a popular read in multiple forms. Anderson still ignores printers, but the razors-and-blades model is covered (Observer, 7/06). 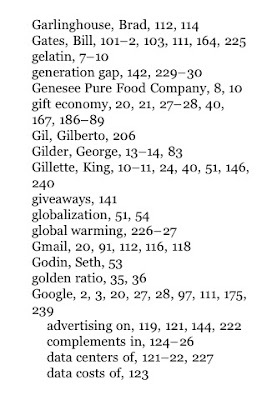 By the way, some of the multiple forms of Anderson’s book are indeed “free” and leverage other printing-related technologies I have written about in my column, including a Kindle/iPhone version (Observer, 3/09) and a version on Scribd.com (Observer, 5/08). So that is what is new with friends and acquaintances that we have made over the last few years. Stay tuned for more ideas, when the fall season rolls around now any day. And, please follow me on Twitter at @jflyons! Summer's respite is over, and it's nice to be back in the office and doing a little blogging! 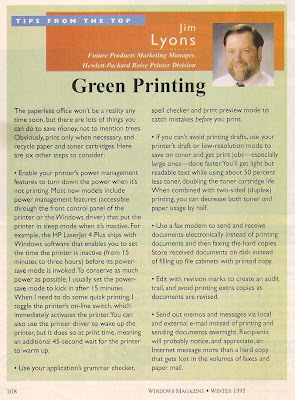 While cleaning out a few of the archives over the break, I happened on an old (Winter 1995) copy of Windows Magazine, including a page featuring me, addressing nothing other than one of the current-day favorite topics, Green Printing. Check it out in the graphic above. No wonder I continue to enjoy covering this topic -- I've got green roots! 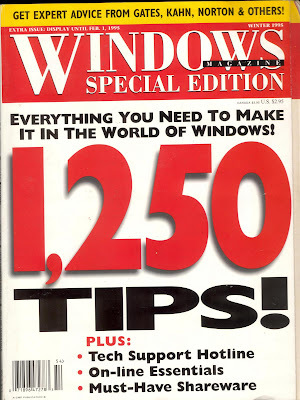 And for historians like me, a quick check reveals Windows Magazine ended its run in 1999, but its publisher, CMP, lives on as United Business Media, and continues with its stable of pubs such as Information Week and CRN.